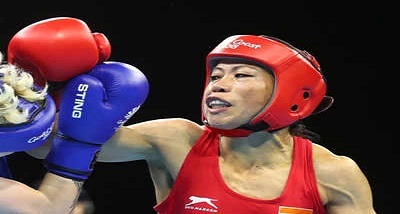 L Sarita Devi, MC Mary Kom, Ritu Grewal and Lovlina Borgohain are assured of medals in the 13th International Silesian Boxing Championship for women in Gliwice, Poland. All the four Indians have advanced to the semi-finals. Sarita defeated Czech Republic's Alena Czechy 5-0 on Wednesday after going past Kazakhstan's Aizan Khojabekova in the opening round of the 60kg category the day before. Sarita will now square off against another Kazakh, Karina Ibragimova, in the semifinals. Five-time world champion and Olympic bronze-medallist M C Mary Kom, got a direct entry into the last-four stage in the flyweight 48 kg category. Among other Indians in fray, Ritu Grewal won her bout against Russia's Svetlana Rosja 4-1 to make the 51kg category semifinals along with Lovlina Borgohain (69kg). Borgohain got the better of Czech Republic's Martina Schmoranzova. However, Seema Punia (81kg), Pwilao Basumatary (64kg) and Shashi Chopra (57kg) lost their respective bouts to bow out of medal contention. In the junior competition, Raj Sahiba (70kg) defeated Poland's Barbara Marcinkowska 5-0. In the 75kg category, Neha got the better of Daria Parada by a similar margin, while Komal (80kg) had to toil for a 3-2 win over Martyna Jancelewicz.